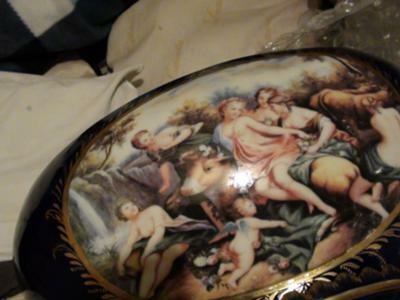 Opinions please … Is this a Dresden or Meissen Porcelain Centerpiece? We recently met an old German gentleman and while buying some puppies from him, my husbands mother who was interested in porcelain antiques, noticed the old man had this piece in his garage. We asked the gentleman if we could buy the piece, but he just let us have it since he said he had no one to leave it to. 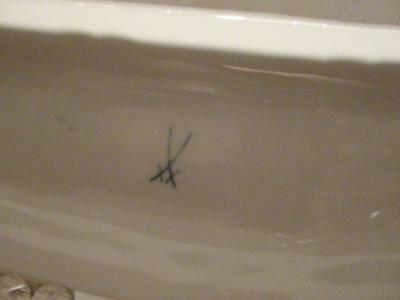 Unfortunately the old gentleman has passed away and we forgot to ask any more about the porcelain at the time. Now we have this beautiful piece and we don’t really know what it is. We would be very grateful for any info on this piece. As Meissen porcelain never made this model, it would have to be a Dresden example, copying the Meissen mark. That would not be uncommon at all. 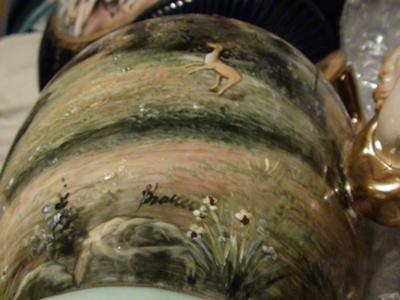 The fact that it is Dresden and not Meissen is also reflected in the style of decoration. One of the scenes seems to be Europa and the Bull by the way. Very difficult to identify whether this piece is genuine Meissen porcelain or even Dresden from the photos. 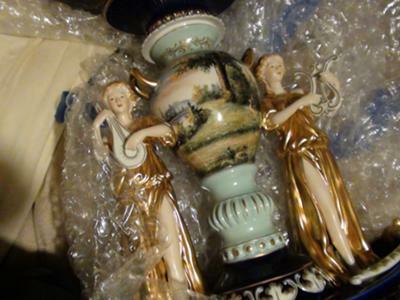 A valuer or antiques dealer would really need better quality photos or to actually hold the piece to guage the quality of the porcelain and the ceramic decoration. Similarly the crossed swords mark should be accompanied by other, mostly impressed, marks that cannot be seen in the photos.